Spacious, fully self contained 1 bedroom apartment located on the south east corner of the building with ocean views. These apartments feature a fully equipped kitchen with dishwasher, laundry facilities, cable television, air conditioning and a balcony. Bedding configuration is a queen or 2 single beds on request. Spacious, fully self contained two bedroom apartment featuring a private patio, full cooking facilities, washing machine and dryer, 1 bathroom, ceiling fans (no air conditioning) and cable television. Absolute beach front ground floor apartment with ocean views. 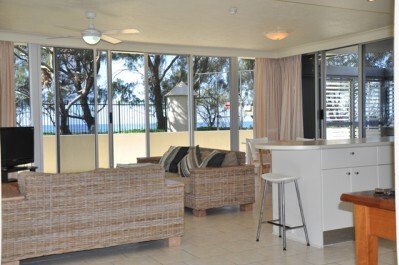 Spacious, fully self contained 2 bedroom apartment located on the north side of the building with views across the beachside reserve to the ocean. These apartments feature a fully equipped kitchen with dishwasher, laundry facilities, 2 bathrooms, air conditioning, cable television and a balcony. Spacious, fully self contained 2 bedroom apartment located on the south east corner of the building with ocean views. These apartments feature 1 bathroom, a fully equipped kitchen with dishwasher, laundry facilities, cable television, air conditioning and a balcony. 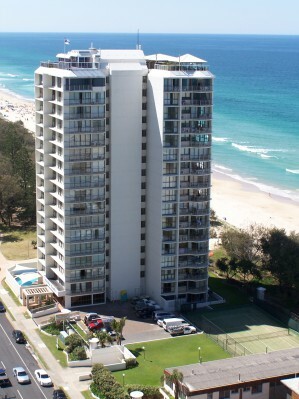 Spacious, fully self contained 2 bedroom apartment located on the north east corner of the building with ocean views. These apartments feature 2 bathrooms, a fully equipped kitchen with dishwasher, laundry facilities, cable television, air conditioning and a balcony. Refurbished, fully self contained 3 bedroom apartment. These spacious apartments are located across the back of the building with ocean views to the north and south. Features include 2 bathrooms, fully equipped kitchen with dishwasher, laundry facilities, air conditioning, cable television and a balcony. Bedding configuration is subject to availability. Spacious, fully self contained 3 bedroom apartment located across the western side (back) of the building. North facing ocean views from the living area and south facing ocean views from the main bedroom. These apartments feature 2 bathrooms, fully equipped kitchen with dishwasher, laundry facilities, air conditioning, cable television and a balcony. Bedding configuration is either 2 queens and 2 singles or 1 queen and 4 singles on request and is subject to availability.